My mom passed away unexpectedly last Wednesday May 14, 2014; 3 days after Mother's Day, 2 days after my birthday, 5 days before the 1 year anniversary of grandma's death. It has been a rough week to say the least. I wrote a eulogy for her memorial service tomorrow. So many memories get conjured up when I think of our mother, Deborah. It's hard to even fathom her death, let alone sum it up into a page of words of what she means to me, to us. I sit here writing this in my car, peering out into an empty park, gazing into the sky at Mt. Hood. A great vast mountain, volcano if you will, a force to be reckoned with. A force to be reckoned with. She was that. She fought hard, she played hard, she laughed hard, but most of all she loved hard. She loved just about everyone she crossed paths with and you knew it; even loving those that have done her wrong. She had a big heart and contagious smile. A heart and a smile that I will dearly miss. Although, she mellowed in her older age, I can remember numerous times in my younger years, if you messed with her or anyone she loved/cared for, you better watch out. It would only be a moment before she would be coming for you. She might of been small in stature but she made up for it in personality. One memory that sticks out in my mind, was when I think I must have been all of 5 or 6, James just 2 or so at the time, pre car seats. Someone jay walked in front of our car as we were accelerating, we had to slam on the breaks to avoid hitting the person, which ultimately threw James and I out of our seats in the back, onto the floor. Of course we were crying. Mom was livid. We literally pulled into the parking lot of where the person was and Mom let them have a piece of her mind via a broken windshield. No holding back. I think the cops may have even been called. Ok, so not the best memory but goes to show don't mess with momma bear and her cubs. That was her. She had a rough life especially these last couple years. She battled addiction for many years but was clean for many, had some health scares but thought most of them were under control, she divorced, but she always came back full circle. She soldiered on when most others may have given up. She was a fighter. I talked to her several times on Mother's Day and on my birthday May 12th, it was just like any other time we talked. Just chatting about the goings on in our lives at the time, asking about the grandchildren, work, etc. Even though states divided us we talked often and it was almost as if she was right down the street. Nothing extraordinary came out of our frequent calls, the call on Mother's Day or my birthday and that is probably how it was meant to be. Casual conversation, between a mother and her daughter, nothing out of the ordinary yet now I consider them extraordinary, those last talks. A memory that I will cherish and hold dear forever. In closing, as we have all soldiered on this past week as mom would have wanted us to do, I keep coming back to a couple verses from one of my favorite songs. As hard as it is to accept, I truly believe mom's "peaceful" passing IS a blessing in disguise. I am sure she is now whooping it up in Heaven , maybe even questioning authority at the holy gates, running into the arms of the other family members we have lost along the way. I love you Mom. Forever on my mind and in my heart. Never EVER forgotten. I am somewhat of a hummus connoisseur. I used to make my own hummus a lot. Trying different spices and sharing with others but of late, not making it as much. I ran across this new to me brand....TRIBE. It is the bomb diggity. And no this is not a sponsored post, although it probably should be. Seriously, this is as authentic as I have tasted. And the one I had was a "limited batch" because it had a little zing to it with a little special somethin' somethin' that I have not tasted in other brands; horseradish. It was DELISH. That there, is it. This is what I am lovin' today, tomorrow. I am a flat bread, carrot stick, cucumber, dipping fiend. Great alternative to your normal boring ol'ranch dip. Just sayin'. You're welcome! Try it, you may just like it. Mom: I left your clothes out on the dresser for school tomorrow. Hayden: Ok, it is gym tomorrow. Mom: Perfect. I left your sweat pants out. Hayden: Make sure you leave a short sleeve shirt. Mom: A short sleeve? It's really cold out. Hayden: Because if you make me wear a long sleeve shirt then it will cover up all my energy and then I won't be able to run fast. There you have it. If you want to have lots of energy and run fast make sure to wear a short sleeve shirt. If only it was that simple; my closet would be stocked full of short sleeve shirts and I would be running marathons everyday. Just sayin'. Ohh wait, he's wearing a long sleeve shirt. Every now and again, I will see a recipe that I just have to try. and sometimes such as this one, not so much. Try as I might, you just can't win'em all. Either I use to much olive oil. for Raw Energy Zucchini Chips. to take a picture of mine. Some were burnt. Some were soggy. They looked more like this. 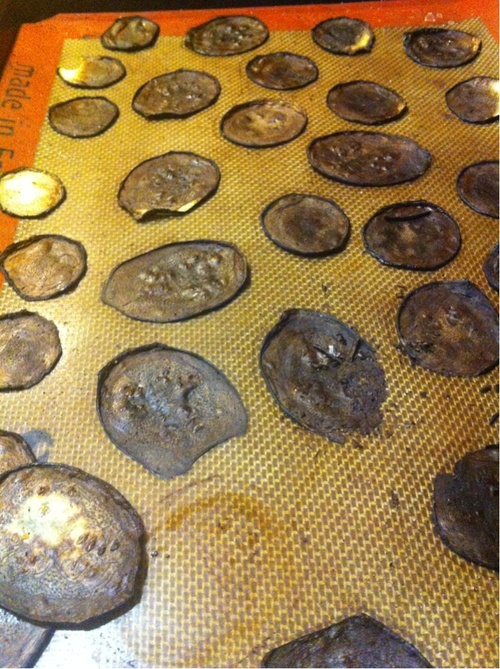 What recipe fails/pinterest fails have you had lately.